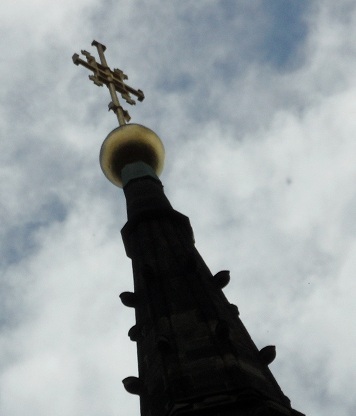 The Cathedral Spire – A Hatchett Job! A couple of weeks ago, I was contacted by Vickie Sutton. Vickie is from a family with some amazing connections to Lichfield. She believes it’s vital that the wonderful memories and stories that have been passed down to her are recorded, and shared with other people, so that they don’t get lost and forgotten. 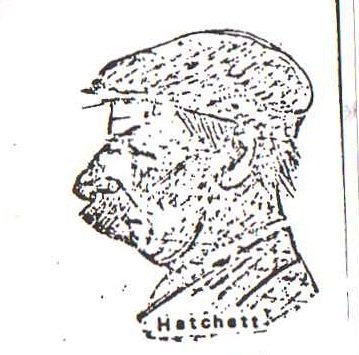 One of the first stories Vickie shared with me is about her great grandfather Henry Hatchett. Henry began working for Bridgemans of Lichfield in the 1890s. Employed as a as a labourer, he mastered the arts of casting, cleaning stone and marble. Henry was periodically sent to Edinburgh to maintain the Last Supper sculpture (based on the painting by Da Vinci) in St Cuthbert’s Church, and as a result, his colleagues gave him the nickname ‘MacHatchett’! (1)Vickie knew that Henry had been involved in restoring the central spire at Lichfield Cathedral and together, we set out to discover the full story…..
Lichfield is of course famous for having three spires but it seems that the central spire has had all sorts of problems! It was destroyed in 1646 during the civil war and was restored in 1666. Between 1788 and 1795 it was restored again with further work being carried out in 1892/3. Twenty-two stone courses were removed from the spire to Bridgeman’s premises on Quonians Lane, where they were either replaced or redressed. I love this story as it shows that even the most well-known of our buildings can still have secrets! I wonder if the addition of the beer and tobacco was an authorised one? Also, does anyone know where the old parchements are stored? I really want to thank Vickie for sharing this. We are working on some more of her brilliant family stories at the moment, but in the meantime check out this link and enjoy some of the views from that troublesome central spire. This entry was posted in ancestors, architecture, Cathedral, employment and tagged architecture, Bridgemans, cathedral, Lichfield by Kate. Bookmark the permalink.